Ever wondered if you’ve got what it takes to fight off the undead? 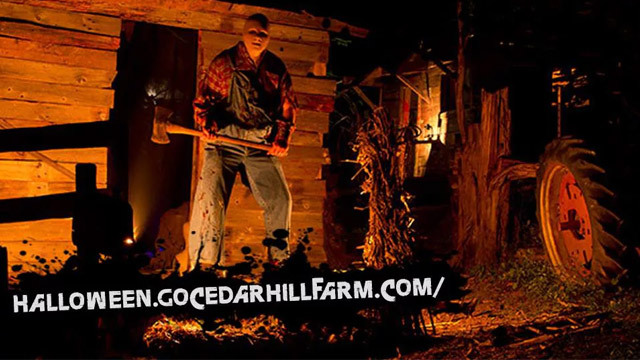 Find out with a round of apocalyptic Zombie Paintball at Mississippi’s Cedar Hill’s Haunted Farm. With five attractions on-site, Cedar Hill’s visitors can create their own adventure on each individually-priced experience. Classic horror figures like Dracula and Frankenstein await on the theatrical Haunted Hayride, and the Trail of Terror takes unlucky souls for an ominous stroll through the nearby woods. Of course, every haunted farm needs a barn… and Sensturbia’s pitch-black twists and turns is designed “to scare you senseless.” However, there is an option for those who aren’t up for the thrills and chills: Cedar Hill’s Haunted Farm does offer a scare-free Flashlight Corn Maize & Tractor Ride, and flashlights are available for sale on-site. You will be touring an antique haunted house followed by a dark , winding trail of terror on over two wooded acres. PG-13 is the suggested rating. Best haunted deal in Mississippi! From underground dungeons to vampire and coffin rooms, this haunt has everything you would hope for and more.